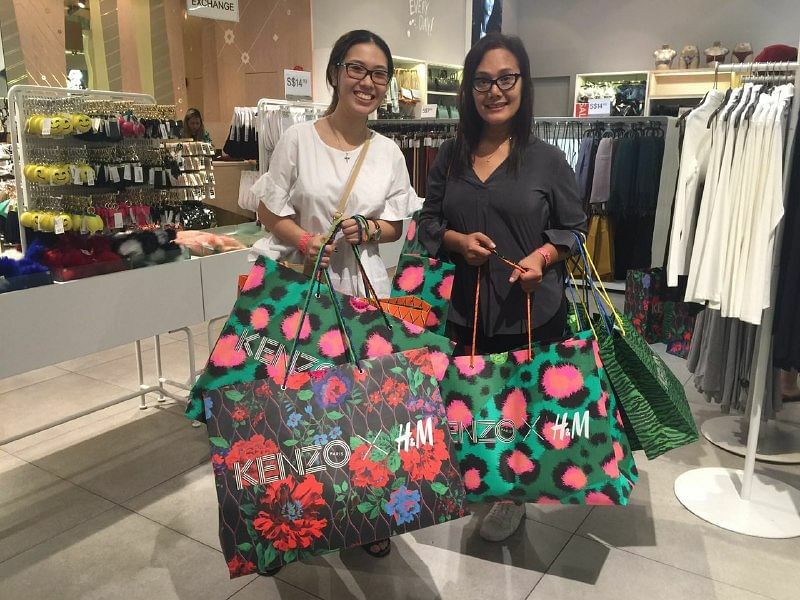 SINGAPORE - H&M's highly-anticipated collaboration with fashion brand Kenzo launched on Thursday (Nov 3) at 8am at two of the brand's stores in Singapore: Orchard Building and Ion Orchard. The queue at Orchard Building started on Tuesday (Nov 1) morning. By around 7.30am on Thursday, there were about 100 people in the queue. The first batch of 30 shoppers were let into the store at 8am and were allocated 10 minutes to grab their purchases. Each shopper was given a wrist tag indicating their allocated shopping time slot. Similar to last year's H&M x Balmain sale, shoppers were only allowed to purchase one piece per style. The store prepared in advance to handle the crowds. 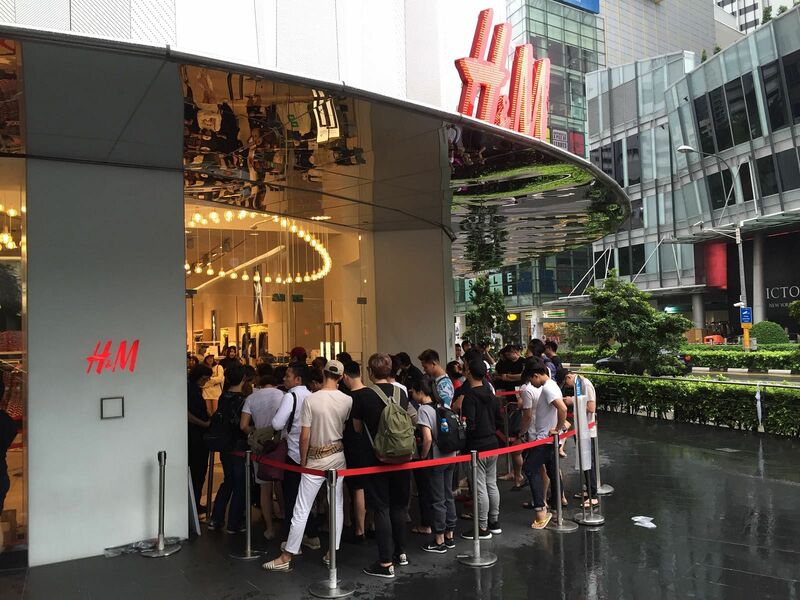 In addition to having a security team on standby, H&M Singapore also hired additional manpower and security for crowd control. 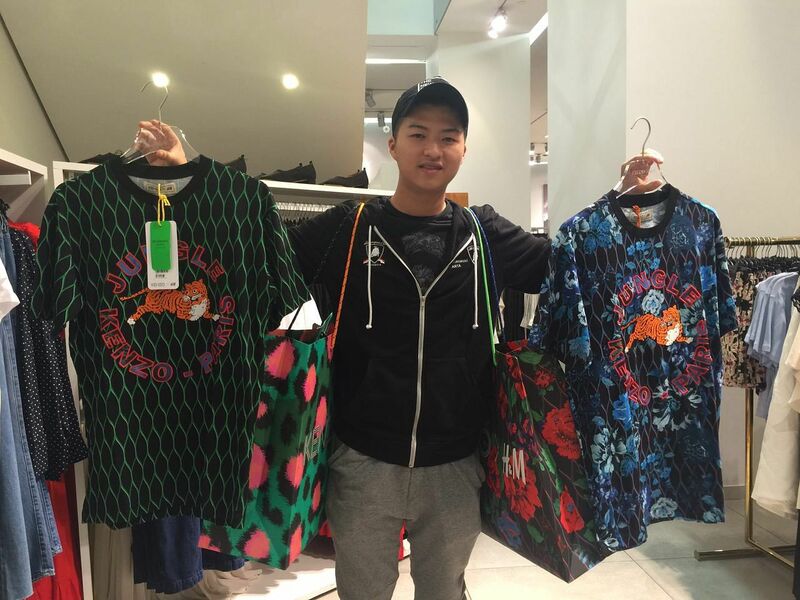 This collaboration, which marks H&M's 13th designer collaboration, is one of the Swedish brand's more colourful and print-crazy collections - not unexpected given that Kenzo is known for its use of bold and vivid animal prints. The 111-piece collection includes items such as tiger-print jersey rollneck tops, leggings, jeans, as well as a floor-length dress ($699) made from 300m of ribbon. Prices range from $17.90 for a pair of tabi socks to $599 for a men's down jacket to $699 for a dress. Homemaker Sherry Kuhara, 43, and student Maria Jessica, 22, first met while queueing for last year's H&M X Balmain and now they are doing it again, this time with the determination to be the first and go away with everything they have their eye on. "For the Balmain collaboration, we started queueing on the day itself at 3am but we were far back in the queue. We only managed to get one item each because almost everything was gone," Ms Jessica told The Straits Times. Mrs Kuhara started queueing on Tuesday at 8am while Ms Jessica joined her on Wednesday after her classes. Said Mrs Kuhara: "I'm really looking forward to this because I'm a huge Kenzo fan. I want to get the sweaters, reversible dress and pajama shirt and pants set. I'm definitely not selling any of these on Carousell - it's all for myself." Mrs Kuhara was joined by her husband to help her purchase some of the items. It was tiring but Mrs Kuhara and Ms Jessica were still excited, despite having to stay in the queue without proper rest. Shoppers in the queue were given only 15 minutes for toilet breaks and 30 minutes for food breaks. They were eventually let into the store at 8am, and were given a time slot and a purchase limit of one piece per style. Mrs Kuhara got her hands on 18 pieces of clothing and left the store with six bags, spending a total of $2,400. "I managed to get everything that I wanted. I feel happy and overwhelmed - who doesn't love shopping? And some more we can enjoy designer fashion at the fraction of the price," she said. However, the queueing had taken its toll on her. "After this I'm going straight home. I'm very tired and I just want to drink water and sleep," she added. "People have asked me to help them buy but I have to think for myself. I want to be the first for next year's collaboration too." Ms Jessica bought a total of 12 pieces of apparel for a total of $1,300. "I got most of the things I wanted - the cutting of some pieces I wanted didn't suit me," she said. "I'm going to try it on again when I get home and rest. We'll try to be the first again next year, depending on the designer." Singapore Institute of Management (SIM) student Richie Ongah, 16, was another who managed to purchase more than a handful of apparel. The Indonesian bought five shirts and sweaters for himself, and a black T-shirt for his sister - spending a total of $567. He had joined the queue last night at 10pm after his friends talked about the launch. His friends however, were not with him at the store. 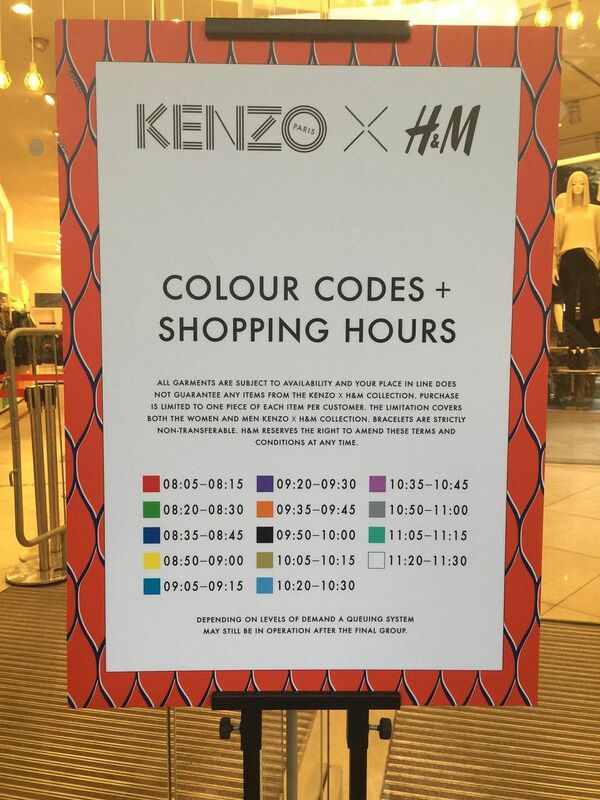 The Kenzo x H&M launch was made available in over 250 H&M stores worldwide, as well as online, from Nov 3.